I, like many others, took one look and had our interest piqued. I mean the draw of Spider-man has always been that he was not a bad guy. He did not go “too far.” This book attempts to answer that question of what if Spider-man went too far. The book starts up normal enough. Bitten by a radioactive spider. Experiment with new powers. Startup in show business. Doesn’t stop Uncle Ben’s killer. Goodbye Ben. And then it goes off the rails. Instead of falling into a spiral of self-pity, Peter makes the decision to go after the guy at the warehouse. He lets the anger take him down the path. The guy is strung up. Innocent bystanders are hurt. Completely not the normal route. Oh, and there is a black suit! With a punisher skull logo on it. Now, the concept is clear here. But the execution falls off the rails while the writer tries to pack in the entire alternate universe style concept into one regular book. First of all, it’s just a blur of a slightly altered Spider-man mythos. Furthermore, the book hinged the entire concept on its alteration of how Gwen Stacey is handled compared to the regular version. And while mildly interesting, the book ends up going super mild at the end. As a result, there isn’t any flavor left in the bubble gum by the time you’re three quarters through this book. At to that, the end of the book basically resets everything back to the way it is now. 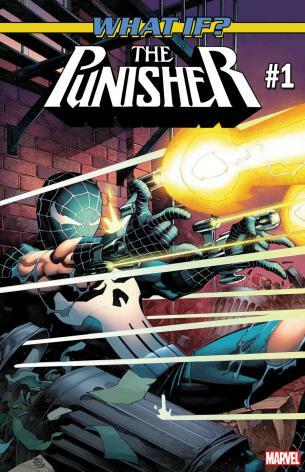 While the concept is cool, Spider-man as the Punisher is more of a gone mild instead of wild. However, it’s interesting enough that as a one-shot it’s worth it if you’re even slightly interested.